I have now been almost two weeks at sea, with no land in sight. The question I have been asked the most is: how is it to live on a ship? With sub-questions like: How many people are living on the ship? Where do you sleep? What do you eat? What do you do? In this week’s post, I will try to answer all of those questions. How many people are living on the ship? 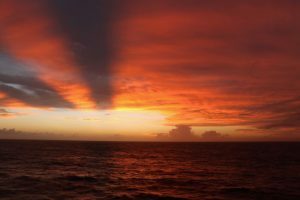 There are 32 scientists, 2 education and outreach officers, 48 vessel and drilling operators, 25 technical science staff, and 15 cooks and stewards, for a grand total of 122 people currently living on the R/V JOIDES Resolution. Since we work in 12 hour shifts, it is very rare that we get to see everyone at once. Where do you sleep? The majority of us share a bedroom with someone from the other shift. For example, I am on the noon to midnight shift, and my roommate is on the midnight to noon shift. That means I rarely get to see her. The bedrooms consist of bunk beds (I got the top one! ), a working desk, two lockers, and a bathroom shared with the bedroom next door. It is modest, but quite comfortable. There is nothing like the smooth rocking of the ship to make you sleep like a baby. Moreover, we are quite spoiled as someone makes the bed every day and cleans (and folds!) our dirty laundry whenever we need it. What do you eat? Chances of starving on the boat are basically nil. Meals are served four times a day (5-7 and 11-1; AM and PM). The only meals that is consistently the same is the 5-7AM one: breakfast with eggs, bacon, and pancakes (with a selection of cereals and bread with jam and peanut butter). The other meals offer a wide selection of western and eastern meals, from soups, to main course, to desserts. There is also a salad bar, fruits, cheese, and crackers. There are also fresh baked goods, cheese, and cold cuts for coffee breaks (at 3 and 9; AM and PM). I am usually sleeping at 6 AM, so I always miss the breakfast meal. In my schedule, breakfast is lunch, lunch is dinner, dinner is the midnight meal. On Saturdays at lunch time (11AM-1PM), there is a barbecue on the deck! What do you do? Most of the time we are awake, we work. On drilling days, we are getting a new core on deck every few hours. We need to process those samples as quickly as possible. When there is no core coming, we work on writing the various reports on the methodology we are using and the results we are gathering. I also need to keep up with my university duties (emails, grant proposal writing, manuscript preparation, data analysis, etc.). I also need to keep communications with my graduate student, research technician, and undergraduate students that are holding down the laboratory fort! Sometimes though, we can get tired. 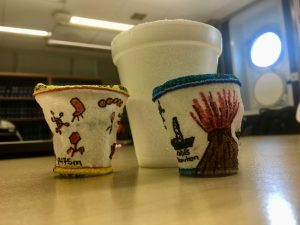 Then we start looking for other activities to do… For example, we decorated Styrofoam coffee cups that were then sent to the deep sea (the pressure makes them shrink to ~ ¼ of the size). The miniaturized coffee cups are now a shrunk version of their original self and souvenirs of a wonderful expedition. In our downtime, there is a wide range of movies to watch in the theatre room. There is also a fully equipped gym (treadmills, stationary bicycles, elliptical, rowing machine, and weights) to exercise. Exercising helps keeping our sanity! The ship is quite large (470 feet long! ), but, after all, we are locked on a small floating board in the middle of the South Pacific! For fresh air, we can go chill on the upper deck, or even walk in circle around the helicopter landing pad. Sunrises and sunsets are also absolutely beautiful! In my next post, I will describe the fate of a sample, from the deep subsurface to the laboratory! Stay tuned!